We ditched our reliable 2011 Hyundai Elantra for a quirky 2009 Saab 9³ wagon. Here’s what happened. Almost a year ago, my then-fiancée Solange and I boarded a plane at LAX en route to Boston to buy a car we had never seen from a seller we had never met manufactured by a company that was no longer in business. Oh, and it had already racked up 128,000 miles. Such are the lengths one will go to satisfy an obsession—one that my fiancée may not have shared but against her better judgement was willing to accommodate. I was almost as excited for the 5000-mile road trip and the subsequent YouTube documentary that was to come as I was to drive what was the car for which I had long lusted: the all-wheel-drive, 2.8 V6 turbo SportCombi (wagon), loaded with Xenon headlamps, rain-sensing wipers, parking sensors, navigation, and an 11-speaker Bose sound system. Solange’s Hyundai Elantra was purchased new four years earlier. It had been reliable, had only 50,000 miles, and would for a few more months still be under warranty, but in several ways it had been lacking. The 1.8L, 140hp 4-cylinder was feeble compared to the ubiquitous 5-series BMWs and E-Class Mercedes-Benzes that dominated the LA freeways, but the worst part was the perilous body roll experienced any time the road turned left or right. Also, it was a sedan. With a sporty wagon, we could have something that not only performed well but also had great hauling capacity—important for the road trips that we so enjoyed. Upon meeting the seller—a British chap in his early 40s named David—we determined that the goods were more or less as advertised and handed over 80 $100 bills and set off down I-95 toward NYC. The first time we stopped for gas I noticed white smoke rising from beneath the hood. I lifted the hood and observed it emanating from between the bulkhead and the engine. “Smoke? No I don’t know anything about it,” said David when I rang. I checked the oil and all fluids, which remained at appropriate levels, and continued toward our hotel reservation in Manhattan. After unloading at our Lincoln Center hotel, I found parking 19 blocks away in the Upper West Side and parked the wagon for the weekend until it was time to bring Solange to JFK so I could continue the journey solo. My first mission: get out of NYC and get this smoking engine bay doused. At night, I sped through New Jersey. Then the Check Engine Light came on. In Hazelton, PA I checked in to a Days Inn, and in the morning, after an Internet search, I headed over to Eurotech in Wilkes-Barre. Taking note of my ambitious itinerary, the Eurotech staff bumped me to the head of the queue—within minutes of my arrival our new wagon was on the hoist and the smoke issue was diagnosed as being threefold in origin. First, during the most recent oil change, performed at a Valvoline Instant Oil Change, the O-ring attached to the new filter wasn’t replaced, but the one from the old filter was reused. Thus creating an oil leak. Second, there was a slow drip from one of the coolant lines leading from the expansion tank. Third, the brake fluid reservoir cap had a broken seal, and that was leaking too. A veritable mess! No matter—$75 (including a complimentary lunch) and I was on my way with a warning that the Check Engine code—P0089 Fuel Pressure Regulator Performance—was common to the Saab 2.8 and generally benign, remedied only a fuel pump assembly replacement (a $1000 job). I barely remember Ohio. I got into Chicago and parked in the Wildwood neighborhood near Caldwell Woods, and in the morning I got on my bike and rode the North Branch Trail—where I learned to ride a road bike in 2012. Moving on, I had just passed Tulsa on the Oklahoma Turnpike when the smoking returned—thick and white. I looked under the hood and saw coolant leaking at that same hose clamp Eurotech had just replaced. I wasn’t going to continue under these cirumstances, and it being late Friday afternoon I would be unable to make it to Autohaus Unlimited, Tulsa’s resident Saab specialist, until Monday morning. I hunkered down in the Downtown DoubleTree for the weekend, rode my bike around Tulsa, and may have ducked into a couple of bars. Monday morning I was at Autohaus before they opened, and when Toby, the head technician, arrived, he pulled out a 7mm socket and a pivoting ratchet, gave the clamp a few turns, and sent me on my way at no charge. Oh well—at least I got in some Tulsa time! The rest of the way was mostly uneventful. I folded out the rear seat and slept a few hours in the wagon’s cargo area at an Arizona rest stop, convinced I was bringing home the ultimate road machine. The next move was, first, another oil change (Mobil 1 0W40) and then to replace the serpentine belt and the transmission oil (ATF). All was fine until our first big repair bill came in January. There was a thudding, booming sound coming from the rear differential—the Haldex eLSD. A quick search online revealed many of these had been replaced under warranty. I called around to price out an out-of-warranty replacement and was given prices ranging between $3200-$3600. Buyer’s remorse started kicking in. I dumped the car at the nearest Saab Official Service Center—Scandanavian Service in Simi Valley. Three weeks later, they changed the three fluids and replaced a clutch pump inside the differential—for under $1000. Good to go. Our next major road trip was in July of this year, to St Louis and back. Before leaving I replaced all six spark plugs and ignition coils and the fuel pump assembly. No more P0089! What we hadn’t counted on was the A/C compressor failing on I-70 near Salinas, Kansas. Admittedly, Solange had been driving a little aggressively with it running while the outside temperature was 108°. With our beagle in the back, we rolled down the windows, opened the roof, bought a bag of ice and put it beneath the pooch and managed to dodge heatstroke. But let’s just say the drive to St. Louis was nonetheless a long one. Once in St. Louis we located a Saab specialist—Ecotech in Webster Groves—who diagnosed the Beaglewagon’s A/C compressor as “clanging like pots and pans.” And another $1000 later, we were chillin’. Back home, the Check Engine Light had returned—P0449 EVAP Vent Malfunction. After extensive diagnostics—and another three weeks—Gert at Scandanavian Service had determined there were two corroded wires at along the passenger floor preventing the EVAP canister from receiving ECU commands to open and close. A little soldering, some shrink tubing, and a lot of money—another $1200—and it was lights out for P0449. Despite having cost us over $4000 in parts and repairs in under a year, we still love the Beaglewagon. It’s comfortable, practical, powerful, handles well, and has quite a lovely exhaust note. Looking around, I don’t think it’s even possible to get a better looking wagon—a newer Volvo V60 Polestar would be nice, and so would a 2014-ish Cadillac CTS-V Wagon, but they both run around $60,000 and the latter gets only 12mpg around town. As for the Elantra, we intended to sell it to a private party, but just when I had it detailed and ready for sale, I espied the perfect trade-in opportunity: a 1999 Saab 9³ Viggen. With 145,000 miles. You might question the wisdom of trading a 2011 car with 54,000 miles for a 1999 car with over 90,000 more, and you would be right, but that’s an explanation I’ll have to provide another time. Mr. Bowman, tear down these walls! Another year, another round of buzz about the potential removal of the hideous and disgraceful pedestrian barriers adorning the four corners of Winnipeg’s premier intersection, Portage & Main. This time the Downtown Winnipeg BIZ has brought in Tim Tompkins, president of the Times Square Alliance and the man instrumental in pedestrianizing a large swath of Broadway in Manhattan, to tell us what we already know: we’re doing it wrong. City planning has come a long way since the late 1970s, and informed opinion is unanimous that the Portage & Main barriers—emblematic of the longstanding supremacy of cars over people in downtown Winnipeg—have got to go. Mayor Brian Bowman even made getting rid of them part of his campaign platform. Well Mr. Bowman, you were elected more than a year ago—what are you waiting for? Were I elected to the Mayor’s Office with a mandate to remove the barriers, there would be no hesitation. Much as the intersection was swarmed upon news of the Jets’ return, at the exact moment victory was confirmed I would invite my supporters to Portage and Main for a celebration rally. With all four corners blockaded and traffic re-routed, I would commence distribution of dozens of sledgehammers and invite the public to usher in a new, pedestrian-friendly era for the City of Winnipeg by smashing concrete like it was 1989 in Berlin. Once the party ended I’d order heavy equipment to finish the job. Pedestrian signals would be set up within the next 48 hours. There’s a precedent for this. Winnipeg wants to be the Chicago of the north? Well in 2003, Chicago mayor Richard M. Daley had enough of the federal airport near downtown known as Meigs Field. The idea of low-flying planes so near the skyscrapers of the city’s vertical skyline was unnerving in the post-9/11 era, and considering they were nearly all private flights for the wealthy he decided it was in the public interest to close the airport and turn it into a park. Naturally the FAA resisted so what did Mayor Daley do? Showed the feds The Chicago Way. Ordered a fleet of heavy equipment to roll through in the middle of the night and tear up the runway. Goodbye Meigs Field. Hello Northerly Island Park. The Winnipeg Way seems to be years of dithering. Decades of hemming and hawing. Sponsor a meaningless design contest. Pay to fly in outsiders. Years and years of blathering on about the topic. Look, if Mayor Daley can break a lease with the almighty FAA, surely Mayor Bowman can grow a pair and void the agreement with the Portage & Main property owners that keeps people out of the intersection. It’s set to expire in 2019 anyway. These barriers are a national embarrassment. What other North American city does this? Not a one. Don’t tell me Winnipeg is special. Other cities have intersections where two wide thoroughfares meet. Really, the appropriate thing to do here would be to return the intersection to the people, and have a pedestrian scramble—where traffic is stopped in every direction so pedestrians can cross from all sides, and diagonally if they wish. Portage Avenue and Main Street themselves could use a road diet. Protected bike lanes. A bus lane. Even then you’ve still got room for street parking and a couple of lanes of vehicular traffic. Winnipeg grew up around an electric streetcar network but for too long has felt the debilitating effects of automobile dependency. Downtown has turned into a massive parking lot, core neighborhoods have thinned out while becoming increasingly littered with unsightly strip malls. I’ve nothing against cars per se—I own three and I change my own oil, thank you very much—but when there’s no other acceptable option for transportation, when the city’s historic primary intersection has been purposely retrofitted to accommodate cars and exclude pedestrians, you don’t have a city that’s inclusive, or vibrant, or ready for the 21st century and beyond. 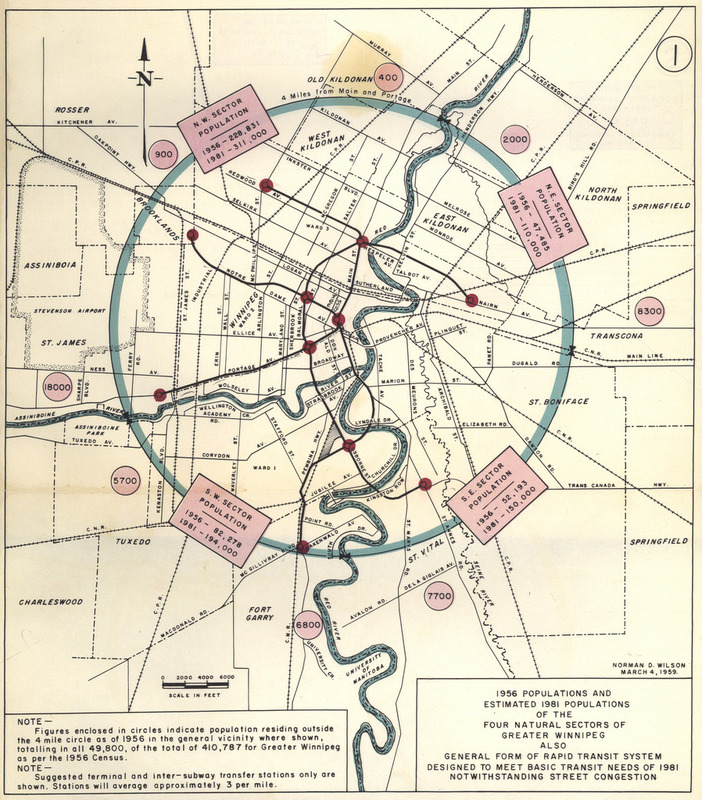 I’ve advocated in the past for the 1959 subway plan that was once a serious consideration in Winnipeg but nobody in political power seems to want to touch it today. Too bad. It’s now more relevant than ever. Meanwhile, the one single action the current mayor can take in order to end the era of car dominance in downtown Winnipeg won’t require a large capital expenditure. Or years of study and endless meetings. Mr. Bowman, it’s high time to call in the heavy equipment. And if you want to do it right, be the first to swing the sledgehammer. Congratulations! You overcame an underdog status to win a hard-fought race and are now comfortably settled into your new office on Main Street. You are the face of the “new” Winnipeg, and, like Nasheed Nenshi in Calgary or Eric Garcetti in Los Angeles, are being lauded as a “hipster mayor.” Which is exactly what Winnipeg needs right now. But being a hipster mayor is about more than the width of your lapels and and which organic fair trade coffee you’re seen sipping at the hippest new café. The policies which you introduce and execute will make the city either cooler, or lamer. And while there’s much about Winnipeg that’s already cool—The Exchange District’s architecture, a great culinary scene, a large stock of historical homes, an impressive network of bike trails—there’s still much that is lame: inner-city poverty, gang violence, sub-arctic winters, an emaciated street culture, an underwhelming transit system. Your job will be to accentuate the former while mitigating the latter. Which is why I’m writing you openly on a matter of imperative importance to the city’s future, a topic more contentious and controversial than any other in this recent election. And while you might well interpret your victory as a mandate to fast-track the implementation of the so-called Bus Rapid Transit scheme, do hear me out as I explain why this idea is 125% lame. And there’s a cool alternative. The first leg of the BRT scheme has been in operation for thirty-one months now, and let’s face facts—it hasn’t been a game-changer. The promised ToD or transit-oriented development hasn’t appeared, as I predicted ten years ago when I was writing for the Free Press. Even during rush hours, I never observed mobs of passengers streaming in and out of Osborne Station. Nobody’s giving up their cars for this. Let’s be honest with ourselves—it’s a bus stop on steroids, not rapid transit. And no matter how much lipstick you put on the pig, a bus is still a bus, and riding the bus will forever carry the stigma of being ghetto. The rest of the plan is only looking worse. While Osborne Station is at least relatively adjacent to high population densities, take a look at this map and tell me what you see. I’ll tell you what I see. The Western Corridor is a passageway to nowhere. Nobody lives south of Wilkes, and hardly anyone lives north of it—and of those few who do occupy those low-density Charleswood neighbourhoods, only a tiny minority will use the route for commuting, never mind as an inducement to car-free living. The Southeastern Corridor isn’t looking much better. None of the neighborhoods it serves has a high density or a large proportion of transit users. The Eastern Corridor services the south periphery of Elmwood but runs too far from most homes to be a practical replacement for the 45 Talbot or 47 Regent buses. The Northwestern Corridor fails to be of practical use to the North End’s largely transit-dependent population base. Billions of dollars will be spent—wasted, I should say—on roadways and infrastructure to run frequent buses to places where people do not want to go, and the majority of passenger trips will remain on regular local and express buses on major arterial routes: Portage, Main, Henderson, Osborne, Salter, Corydon. That millions of dollars went into studies that resulted in this map is to me a source of major second-hand embarrassment. It should be plain to anyone who knows the city and its transit patterns that this is a complete non-starter, but somehow it got started. It must be stopped. It’s time to take another hard, serious look at the Norman D. Wilson subway plan. Now here’s a scheme that parallels major arterials and actually goes where people live and work. River & Osborne? Yup. Health Sciences Centre & St. Boniface Hospital? Covered. City Hall and The Exchange District? Right there. The Manitoba Legislature, Polo Park, Portage and Main, and The Forks? All of the above. The North End, the West End, Elmwood, Weston, Norwood and Old St. Vital are all represented. 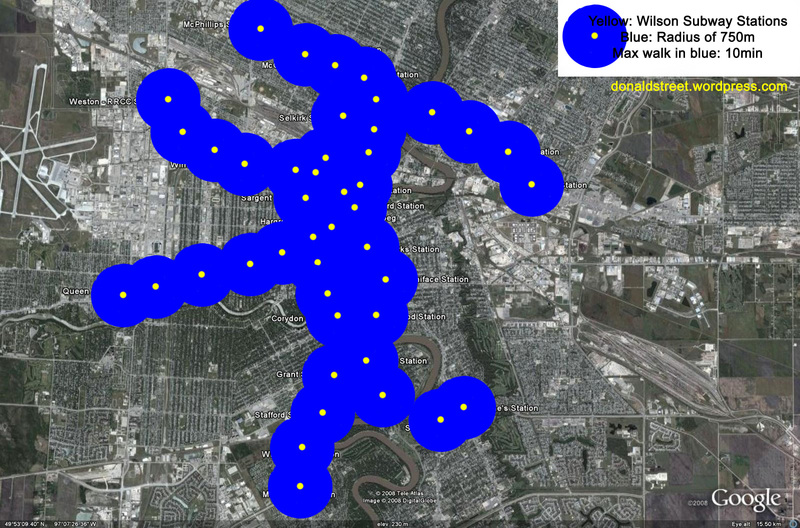 It could be expanded: south, to the U of M; west, to Assiniboine Park. And it’s underground. Truly rapid. Protected from the elements. Before I go on, let me address all the pat objections. This has been studied more than once (1958 & 1966) and, from an engineering perspective, a subway is totally doable with Winnipeg’s subsoil conditions. So let’s move on to the ostensibly unaffordable price tag. When you consider the ROI [return on investment], it’s the BRT plan that’s looking unaffordable. A bunch of busways to and from peripheral suburbs servicing mostly uninhabited areas aren’t going to do much for the city except perhaps enrich some already wealthy construction contractors. On the other hand, this subway plan would create an entirely new Winnipeg, with high density nodes around every station. Can’t you see multi-story mixed-use projects at, say, Isabel and William? Main and Mountain? Osborne and Morley? These are urban intersections whose base densities were established during the streetcar era, and this density can be further built upon once served by a transit system that is an actual conduit to car-free living. We need to work within the existing grid rather than pray for prairie to magically turn into vertical homes because a glorified bus route opens nearby. That’s never going to happen, and we shouldn’t want it to happen. Let’s now address the obvious—in a jobs and labour marketplace that’s increasingly global, Winnipeg is faced with a massive, almost insurmountable, liability: it’s cold. Really cold. On average, 113 days a year the temperature never rises above freezing. Given a choice, talented, educated workers are generally more repelled by than drawn to extreme cold climates. That’s why my brother, a chiropractor, and my best friend from high school, a teacher, are enjoying life in Singapore. It’s why so many of my former classmates have settled in Vancouver. It’s why I’m writing this from Los Angeles. It takes an almost masochistic temperament—or, at the least, vested business interests—to endure such painfully extreme polar vortexes so many days of the year when one is free to leave. There has to be an equalizer. The BRT plan simply ain’t it. Toronto and, especially, Montreal are both cold (albeit less so) cities that enjoy robust car-free cultures. Surely I needn’t point out why. In the absence of comparative proportions of transit usage, Winnipeg will by comparison always be lame. It will bleed talent and struggle to attract newcomers. The critical mass of density and street culture that Winnipeg needs to compete in the global marketplace as a world-class city capable of attracting top talent—it won’t ever arrive if we continue building busways. It’s going to require building a transit system that, much of the time, is more attractive than driving. That means going where people already go—along existing major arterials. And it means being protected from the elements—underground, with warm, indoor platforms and trains unaffected by the amount of snowfall outside except insofar as the more the streets are covered in snow, the greater the demand for subway services. Mayor Bowman, are you thinking this vision too bold, too impractical? Duff Roblin too dealt with naysayers, and where would the city be today were it not for the Floodway—which 1997 demonstrated was in fact too timid an ambition and had to be expanded at a cost much greater than if it had been built sufficiently in the first place. Calgary is finding out that its Light Rail system, opened in 1981 after intense naysaying and opposition, was actually too timid a scheme as its station platforms are currently being modified to accommodate larger trains. From the Legislature to the Aquaduct to the Esplanade Riel to the Canadian Museum for Human Rights, this city’s greatest gems are the result of grand ambitions. Where will the money come from? Find it. Squeeze the province for Hydro dollars—the subway would be a showcase for electric-powered transport. Shake down the feds—the impoverished state of the inner city is a national embarrassment. Implement a civic sales tax if necessary. But ultimately a subway would pay for itself, in growth. Naysayers might well say that no one moves to a city for its transit system, and even if that’s untrue people—especially talented, educated people—will move to a city to enjoy the sort of culture that a great transit system will create. The real question is, how can we afford not to do this? 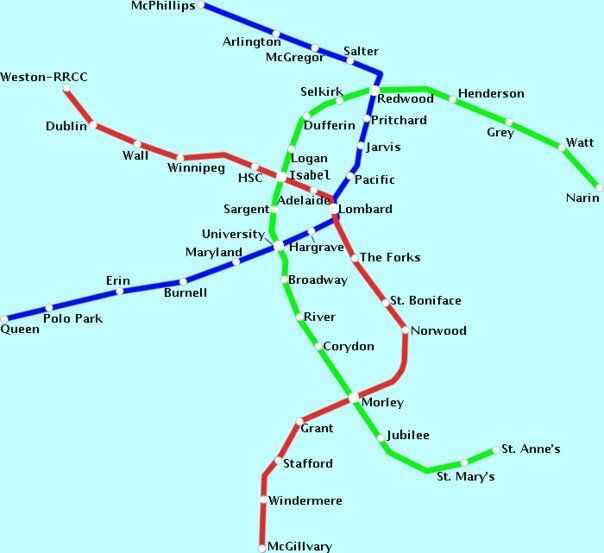 In a parallel universe, Winnipeg has already completed this subway system, and we never fell behind Edmonton or Calgary. Verticality. Walkability. Density. These are the hallmarks of a “world-class” city, and if your campaign rhetoric is to become anything more than empty words we’ll need a world-class transit system to go with our world-class hockey team and world-class National Museum. 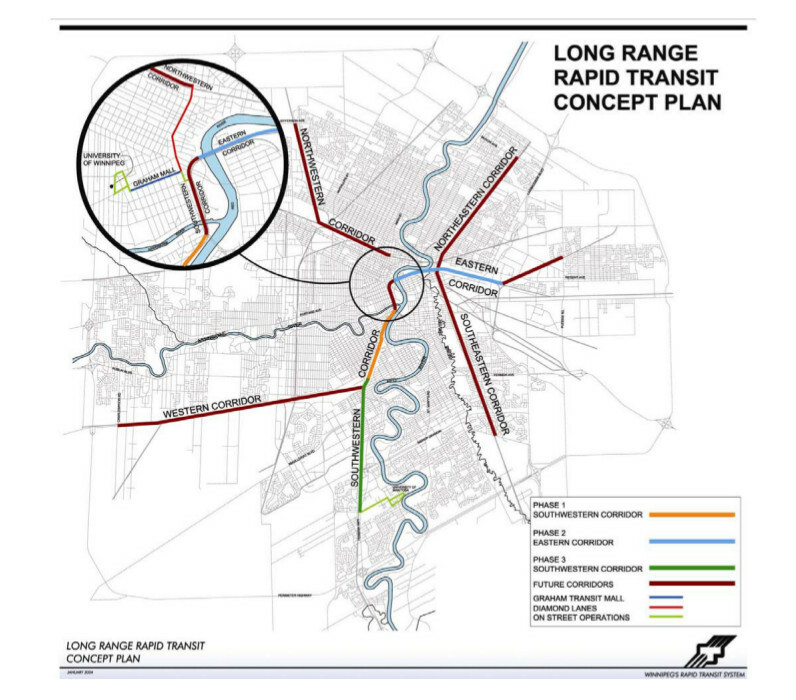 This BRT plan was conceived while Winnipeg was still stuck in the minor leagues. And, real talk—it was forged so thoughtlessly one can only wonder whether it was proposed by incompetents or, for whatever reason, intentionally introduced to fail. The proper function of a rapid transit system is to move people to and from various neighbourhoods and points of interest within a city. Need I remind you that in 1972 Winnipeg amalgamated twelve towns, cities, and rural municipalities to create the 464 km² behemoth it is today? The Southwest Corridor excepted, the point of the BRT plan seems to be to feed residents from far-flung suburbs, where almost nobody lives, into the downtown centre, where almost nobody from the suburbs wants to go. And if they do, it’s almost certainly not by bus. The Wilson subway plan would do more than give commuters a way from the suburbs to downtown—although it would do that too. Primarily, it would provide an efficient means of transporting, regardless of weather, people around the city core, the pre-1920 grid. Where the greatest densities remain, and where there exists the greatest potential for added density through vertical infill. Downtown Los Angeles is in a residential building boom. Hotels, condo hi-rises, and multi-storey mixed-users are popping up where surface parking lots once were. Forty years ago Downtown LA was synonymous with urban decay. Now it’s one of the hottest real estate markets in the country. It’s no coincidence that between 1963 and 1990 there was no rail transit serving DTLA. Now there are the Metro Gold, Blue, Expo, Red, and Purple Lines (the latter of which just broke ground on a westward expansion yesterday) and LA, having run out of lateral space on which to build, is by necessity going vertical. Winnipeg will never run out of lateral space. Inducing wide-scale vertical development is going to require a powerful incentive to keep the city tight. The only possibility is proximity to subway. I realize being mayor doesn’t make you God. You’re just one man. But you can work on building a consensus for this. You can foster the political will. You strike me as a sincere man who wants what’s best for the city, and you’ve been told that this BRT plan is the best way to go. But now that you’re elected, you can change course. You’re a relatively young man. Young enough to see the ribbon-cutting on Winnipeg’s first subway line well before you reach old age. Demand the impossible. Don’t sell us short. This is your chance to have your name become as synonymous as Duff Roblin’s as this city’s saviour. Now how cool would that be? Upon leaving office, George W. Bush returned to the seclusion of his 1,600-acre ranch 20 minutes out of tiny Crawford, Tex. — itself two-and-a-half hours from Dallas-Forth Worth. Bill Clinton came to the White House via the Arkansas Governor’s mansion and exited into a modest 11-room Neo-Dutch Colonial in exurban Chappaqua, N.Y. — an hour’s drive from Manhattan. Ronald Regan lived in Bel-Air (the Los Angeles suburb made famous by the Fresh Prince), Jimmy Carter on his peanut farm in Georgia, Gerald Ford in Virginia’s wealthy Alexandria, LBJ in the Houston sticks. Even JFK, who spent two boyhood years in the Bronx and enough time in Boston, made his primary home at the six-acre Kennedy Compound in small-town Hyannis, Mass. So vast has been the succession of country and suburban gentlemen to the Executive chair that finding an urban president — a man who lived and worked primarily within the core of one of America’s great metropolises — requires looking back to 1881, when, following James Garfield’s assassination, the nation’s highest office fell to vice-president Chester A. Arthur, a lawyer and civil servant who before and after the White House lived and worked in Manhattan. In 1984, a 23-year-old Barack Obama, freshly graduated from Columbia, vacated his Manhattan apartment to accept directorship of the Developing Communities Project, a non-profit in South Side Chicago. Here, along East 53rd’s sidewalks bustling with well-dressed families both black and white, Obama found a neighbourhood perfectly befitting a bi-racial Ivy League man: Hyde Park. It’s a salt-and-pepper, middle-class mix, an educated enclave encrusted with architectural gems, bordered by Washington Park to the west, the splendid University of Chicago to the south and to the north, wealthy Kenwood, where Obama’s mansion lies a quarter block north of tree-lined Hyde Park Boulevard. Hyde Park is the American Dream manifested — a model of integration and an oasis of prosperous civility in a South Side desert that saw much of its housing stock razed in the 1960s and 70s as landlords walked away from their properties. Incredibly, for the first time in 127 years, we have a president whose primary residence sits where he can walk just minutes to shop for groceries, dine at dozens of restaurants, visit a museum or take a dance lesson. Unless he’s leaving the neighbourhood, Obama can leave his Ford Explorer Hybrid parked at home. Or he can get downtown in minutes via the 6 Jackson Park Express or by hopping on the Metra commuter train. At least he could’ve until the mandatory motorcades. Coming from Obama, these words actually carry weight. Indeed, the Web site included an entire page devoted to Urban Policy with a promise to create a “Director of Urban Policy [who] will report directly to the president and co-ordinate all federal urban programs.” Other big ideas: a $7,000 federal tax credit for new hybrid vehicle purchases, and a goal of one million plug-in hybrid cars on America’s roads by 2015. And knowing that Chicago’s elevated train system is what has kept the city’s centre strong, look for Obama’s planned National Infrastructure Reinvestment Bank to invest big-time in mass transit with new lines, extensions to existing lines and brand new light-rail train systems being rolled out. Even with oil less expensive than it was months ago, the first casualty of many home budgets in any downcycle will be the vehicle — expensive to maintain and largely unnecessary in the presence of good-quality transit. Rather than being catastrophic, a large-scale relinquishing of automobile ownership will add value to neighbourhoods that, like Hyde Park, enjoy 24-hour transit service and a walkable scale. Hyde Park represents the sort of “regional innovation cluster” Obama’s Urban Policy seeks to promote. If his home neighbourhood has helped shape his vision for city neighbourhoods throughout America, we might indeed be in for an urban renaissance that outdoes even the last decade. On Thursday, Canada’s Natural Resources Minister Gary Lunn announced he’s going to save me $50 a year by removing incandescent light bulbs—a bad habit I cannot seem to break on my own—from the retail marketplace by 2012. Mr. Lunn would prefer our using compact fluorescents, illuminated by a thrifty 24 watts of electricity versus the profligate 60 of my clear incandescents, and he’s determined to force a switch regardless of consumers’ wishes. The only drawback I see to a compact fluorescent conversion is that the lighting in my 95 year-old home will henceforth be hideous. The refinished hardwoods, elegant banister, French doors and plaster archway will fail to be so splendid under a colour of light typically associated with such places as call centres, intensive care units, and auto parts stores. Governments worldwide are seemingly annoyed that consumers still favour Thomas Edison’s 128 year-old invention. They’re cheap, but “inefficient”—ostensibly to a degree that would have their sale criminalized. Will this create a black market for incandescents? A War on Edison? Many consumers haven’t gone fluorescent for the same reason I haven’t—it looks and feels nasty. Not all lighting is created equal; beyond brightness, there are qualitative elements. Which explains why so many upscale retail stores eschew fluorescents for halogen (incandescent) lighting. And it isn’t just my intuition telling me fluorescent lighting is evil. Dr. John Ott, a pioneering researcher into full-spectrum light, experimented with mice and found found that, “…[T]he life span of the animals was more than doubled under full natural light, as compared to those under the pink fluorescent light.” Indeed, a number of scientific studies have linked fluorescent lighting to depression, impotence, headaches, eye strain, sleeping disorders and skin cancers. Drawbacks of fluorescent lighting aside, the banning of a product on the basis of its inefficiency sets a terrible precedent. If governments are going to intervene in the marketplace over light bulbs, why stop there? Let’s ban registrations of fuel-inefficient vehicles, starting with V-10, V-8 and V6 engines by 2012 and extending to anything that isn’t hybrid-electric by 2015. Let’s ban meat. Ban dairy, gasoline lawnmowers, leafblowers, flushing after only peeing, falling asleep with the TV on, and single detached homes. If we cut enough corners in life, make these small sacrifices for the good of the collective, we can meet Kyoto’s challenge, thus saving the planet—right? Frighteningly enough, there are a lot of people in Canada who would welcome many of the absurd steps in this hypothetically radical left-wing agenda. Surreally, it’s a Conservative minister that is initiating a market intervention to remove an long-established and satisfying product from stores. But perhaps that makes sense. What might be the reaction if it were provincial NDP or the federal Liberals introducing this? The incandescent bulb, a powerful invention that has changed our daily life in so many ways during the 20th century, makes for an odd scapegoat amid all this global warming razzmatazz. Lighting constitutes but a fraction of the typical household energy consumption. And to me, it’s worth $50 a year to enjoy the sort of lighting I prefer. I recycle, shop locally, don’t drive, carry my groceries in a backpack rather than a plastic bag, and my compost bin is on order. If I want to shell out for lighting that doesn’t feel like poison, why does the government want to stop me? Maybe there’s more to it than just inefficiency. It seems to be part of a general, unconscious trend within society to embrace a brute rationality at the cost of aesthetic values. Neo-classical and terra cotta buildings, for example, are supposedly impossible today because, although our economy is wealthier than ever, the construction costs demand minimalist concrete, glass and steel. Where wearing a suit was once mandatory, the new office uniform is khakis and a golf shirt—often with sneakers. Dining room conversation during family dinner has given way to a new ritual of silently zoning out in front of the TV. If bulb manufacturers aren’t outraged at being forced to shut down their incandescent manufacturing, it’s because the market gap will soon be filled with demand for more expensive (and profitable) compact fluorescent bulbs. Somehow I think they’re more excited than annoyed. Meanwhile, I’ve found a way around this. For the next five years I’ll be stockpiling boxloads of classic incandescent bulbs up in the attic—enough for dozens of lifetimes, since they are so cheap. Not only will I never have to suffer using compact fluorescents, I’ll have made a smart investment. When prohibition begins, and your money is looking for incandescents, talk to me and I can sort you out—just so long as you’re not an undercover. During the‭ ‬20th century,‭ ‬there was among economists much debate about what role the government should have in shaping economic policy.‭ ‬While interventionists,‭ notably‬ John Maynard Keynes,‭ ‬believed government programs necessary to tackle the problems of unemployment and inflation,‭ ‬Milton Friedman—who died this week at age‭ ‬94‭—‬believed the best thing a government could do to help an economy is get out of the way. Calling himself a‭ “‬classical liberal,‭” ‬Friedman audaciously dismissed the interventionists,‭ ‬shredding several of Keynes’s theories in the process.‭ ‬Above all,‭ ‬Friedman stood as a champion of not only economic but human freedom,‭ ‬notoriously advocating against compulsory military service,‭ ‬restrictions on foreign trade,‭ ‬and the criminalization of prostitution and drugs. In‭ ‬1976‭ ‬Friedman was awarded the Nobel Prize in Economics—one of several distinguished awards he was to receive throughout his lifetime.‭ ‬Yet his humble beginnings in working-class Brooklyn affirmed the axiom that free markets will reward the patient diligence of individuals with the fruits of prosperity. While free-market philosophies have come to dominate economic thinking as of late,‭ ‬it was only as recently as the‭ ‬1970s that then-president Richard Nixon declared himself a Keynesian.‭ ‬By that point Keynes himself had been dead for decades,‭ ‬but Friedman was around to blame the decade’s stagflation—high unemployment coupled with high inflation—upon Keynesian economic policies.‭ ‬Friedman’s laissez-faire thinking subsequently became valuable currency during the tax-slashing age of Reaganomics. It could be argued that Friedman’s influence upon the direction of the world’s largest economy in the‭ ‬1980s led to America’s even better economic performance during the‭ ‬1990s.‭ ‬Low inflation,‭ ‬a raging bull market in securities,‭ ‬the widespread gentrification of formerly blighted urban areas—the century’s end was kind to America,‭ ‬a vindication of once-controversial free trade agreements and the monetarist school of economic thought with which Friedman’s name became synonymous. Friedman’s ideas owe much to the man known as the first economist,‭ ‬Scottish philosopher Adam Smith,‭ ‬whose seminal‭ ‬1776‭ ‬work‭ ‬An Inquiry Into the Nature and Causes of the Wealth of Nations‭ ‬famously suggested that an‭ “‬invisible hand‭” ‬would guide people toward their own self-interest.‭ ‬Classical economists such as Smith believed that a natural state for free economies was full employment.‭ ‬The United States today,‭ ‬with a population that has recently passed the‭ ‬300‭ ‬million mark,‭ ‬has an unemployment rate of just‭ ‬4.6‭ ‬per cent.‭ ‬With an increasingly mobile workforce delivering labour to where it’s needed,‭ ‬America has work for nearly all of her willing citizens—and even,‭ ‬as has lately been much-reported,‭ ‬her undocumented immigrants. Perhaps the most impressive aspect of the American economy is how new entrepreneurs are being made daily,‭ ‬many of them earning a living in ways most unlikely.‭ ‬Only in America could you,‭ ‬for example,‭ ‬make your fortune as a professional harmonica instructor.‭ ‬Or,‭ ‬for that matter,‭ ‬as a Barry White impersonator. During Friedman’s long life he got to see laissez-faire economics move from unorthodox to mainstream.‭ ‬He observed the failings and the collapses of centrally planned juggernauts in the communist world.‭ ‬Despite his advanced age,‭ ‬he never plunged into senility,‭ ‬opining in‭ ‬2004‭ ‬that even as Russia and China have become freer with their embrace of market capitalism,‭ ‬many western societies were suffering beneath the yoke of increased regulation.‭ ‬Still,‭ ‬he did,‭ ‬during that interview,‭ ‬declare himself‭ “‬an optimist,‭” ‬and although he had already won many battles,‭ ‬he would still continue to argue for school vouchers and privatizing Social Security. If you believe sound monetary policy, rather than happenstance, to be responsible for today’s prosperous times, do remember Milton Friedman. He may have left this world, but his ideas are here to stay. Strolling through Winnipeg Square one afternoon this week, I aimed for an oasis of frivolity amid the underground concourse’s sober bustle — RC Amusements, a longstanding video arcade tucked behind the Kernels popcorn stand since before I could remember. So timeless did the place seem that I was stunned when I found it was gone. Oddly enough, I fell in love with downtown Winnipeg because of video games. Among my early memories is a mid-1980s trip to Long John Silver’s, an arcade on Portage Avenue that seemed, at the time, the most exciting experience of my life. It wasn’t just the games. The sounds, people, voices, lights, and carnival atmosphere provided soothing stimulation to an easily bored, hyperactive child. By the time I was eight, the Saturday bus ride downtown had for me and my schoolmate, Alan Charbonneau, become a weekly ritual. After a week of waking at six a.m. to deliver newspapers, we rewarded ourselves by leaving our parents behind to wander from Saratoga Amusements to Games on the Avenue — usually stopping at Comic World in-between — battling it out at Karate Champ or Bubble Bobble during the lull in home gaming that existed between the Atari and the Nintendo. During weekdays, we had to contend with the local Double Dragon machine at St. Anne’s Food Store — invariably surrounded by what today would be the unthinkably politically incorrect spectacle of chain-smoking sixth-graders in full heavy metal attire. These older fellows were prone to shaking you down for your comic book money and most often smelled as nasty as they appeared. The corner store arcade game was a cornerstone of the youth community even years later. During high school, the 7-Eleven near Glenlawn Collegiate played host to a seemingly incessant Street Fighter II tournament. Among the boys, social rank and popularity within the school’s halls were actually in large part determined by how well you played that game. By this point, heavy metal kids had become nearly extinct, leaving me jostling for status against the jocks, preppies, skaters, and hip-hoppers of the moment. Arcade culture probably peaked around 1992, with the opening of Lazer Illusions — a giant, futuristic arcade in the east wing of Polo Park Shopping Centre that had a notorious rule forbidding ball caps worn backward. Lazer Illusions lasted just a couple of years, after which the mall no longer seemed to be made for young people. Downtown, however, always remained the Saturday destination. My explorations eventually led me off the Portage Avenue strip. Crystal Palace, a 24-hour billiard hall with a significant arcade, appeared on my radar when I was 12. Located at Ellice and Donald, in the basement of the building now occupied by the Giant Tiger discount chain, Crystal Palace’s menacing ambiance lent me a sense of toughness that seemingly pushed me nearer to manhood. These days, gamers are more likely to be grown-ups than kids. Indeed, according to an poll in May, 40 per cent of U.S. adults play video games. Few, however, do so in the public atmosphere of a video arcade. Opponents are likelier to be across the world via the Internet, each player sitting solitary at home. Or perhaps at a cyber caf , seated at a terminal, matched against someone across the room. Either way, the social component of video gaming has been lost. Ordinarily, I would count myself among the majority who do not play video games. Sometime in high school my leisurely interests shifted to things more tangible: Girls, skateboarding, billiards, books. About a year ago, however, my girlfriend and I rediscovered Winnipeg Square’s RC Amusements, and we began consciously visiting at least once a month. Somehow we both knew RC’s days were numbered. A combination of sentiment and nostalgia kept us coming back, perhaps hoping our occasional patronage would itself maintain the place. Possibly we were seeking to squeeze out a few more memories before the opportunity disappeared. Thankfully, there remains one last video game arcade downtown, and it’s open 24 hours daily: Bourbon Street Billiards, at Vaughan St. and Graham Ave. Not that I’m itching to play, but these games are best enjoyed publicly, with strangers and with friends. RESPONDING to a recent rash of robberies, Salisbury House, that most Winnipeg of culinary institutions, has declared it no longer wants your paper money after 10 p.m. Would-be robbers are thus advised to arrive before then. Seriously, what happens when Sal’s gets robbed at 9:30? Will they scale back the cash ban another hour? What if there’s a hold-up during lunch hour? Will they move to refuse cash altogether? Call me old-fashioned, but I’m a cash-only sort of fellow. I don’t have a credit card or an ATM card. I like to see my money disappear when I spend it. Thus it’ll be interesting to see what happens the next time I roll in with a case of the midnight munchies and ravage a Three Cheese Double Nip plate. The process cheddar, mozza, and swiss will still be warm in my belly when the staff gets stuck with my handwritten IOU for $7.49 plus tax. There are a number of reasons I don’t pay for things via debit card or credit card. My financial institution does not need to know I’m addicted to energy drinks or that I occasionally buy a copy of British Vogue. When, instead of handing over the cash, I swipe the stripe, the expenditure seems less tangible than when I have to part with my paper. Thus I end up spending more. Moreover, most banks apply service charges to debit card transactions. It’s bad enough the government taxes everything I buy — I would rather my bank didn’t as well. Thus I scissored my debit card years ago and have never regretted doing so. Should a business be permitted to refuse legal tender? I think not. Cash rules, or at least it used to, and the currency of the Bank of Canada should be respected by all merchants open to the public. Actually, despite my general distaste for government regulation, I would prefer to see a federal law mandating that businesses must accept cash payments. To discriminate against cash-holders is a disgraceful practice. While I sympathize with Salisbury House for being a frequent target of crime, have they ever heard of a drop safe? Seems to work for 7-Eleven. Regardless, during the recent robbery at Sal’s Fermor Avenue and St. Anne’s Road location, the robbers, according to a Winnipeg Police Service news release, “allegedly went from person to person, physically assaulting them and taking their money.” That is, they robbed not only the restaurant, but the restaurant patrons themselves, à la Pulp Fiction. How would a no-cash policy have prevented this? Will Salisbury House next insist that customers’ wallets be empty in order for them to receive service? Salisbury House has set an alarming precedent. I can’t help wondering, What’s the next step? How many other businesses will hop on the no-cash bandwagon? How many will refuse cash payments completely? Most importantly, what will that mean for the thousands of Winnipeggers, and out-of-towners, who, like myself, value their privacy, or just prefer to pay with paper? As far as those cash-resistant merchants are concerned, we can go to Hades, or take our business elsewhere — to soon-to-be increasingly scarce cash-friendly merchants. There will be diminishing room for stubborn holdouts in this brave new world of commerce. If you don’t like your every transaction tracked and recorded into a database, too bad. You’ll need an ATM card or a credit card to be a legitimate member of society. Sal’s has taken a step down a slippery slope at the bottom of which customers will be paying via thumbscan or microchip implant. Think I’m exaggerating? Go to Japan, where ATM withdrawals require a biometric palm-print scan. Or check out a company called Applied Digital Solutions, which touts the “secure payment” applications for its skin-implantable VeriChip — a product the company is currently pitching to the U.S. military for its entire armed forces as a replacement for their dog tags. There is in Winnipeg a constant chatter about the urgency of reinvigorating the inner city and downtown especially. Unfortunately, the specific, concrete steps that must be made are seldom mentioned, and all the splendid ideas have not been satisfyingly formed into a cohesive plan. Since the need for a vision is what’s most often suggested, here’s one: Busy sidewalks outside a strip of storefronts. They offer bakeries, groceries, hardware, video rentals, hairstyling, cafs, newspapers and books, banks, clothes and shoes, photo developing, etc. Narrow buildings three to five storeys tall, landmark buildings 10 or more storeys at major intersections, every five or so blocks. In the storeys above the stores live people whose windows give a great view of the sidewalk below. Natural surveillance from overhead windows and the constant pedestrian traffic flow foster a safe walking environment. A robust retail experience translates into a stalwart social and community one. The bustle, and the sense of safety, spills out into the residential side streets: Rows of two-storey upright wood-frame houses with front porches, the occasional three-storey walkup apartment block, the odd small storefront in front of an old house. Hundreds of such blocks already exist in Winnipeg. Traditional city neighbourhoods not only have a powerful attraction upon visitors, they are highly desirable places to live. Renters who live near a well-established city shopping street pay a premium for their location. This is as true here near Corydon Avenue as it is in Vancouver near W 4th Ave., or in Toronto along The Danforth. But many Winnipeg city streets have potential to outshine today’s Corydon. One squandered resource is Selkirk Avenue. Originally the centre of the city’s Jewish and Eastern European life, it offered a commercial extravaganza, attracting shoppers from outside the area to its delis, bakeries, and sundry services. There was much pedestrian action: Selkirk had frequent light-rail (streetcar) service and residential densities nearby. Today Selkirk offers pockets of urbanity, a few gems of old buildings, some unique or specific stores and services, but there’s enough abandonment and emptiness to make the strip a failure, which it will remain until continuity is restored. Envision a continuously safe, walkable urban area, spreading from a cohesive, continuous downtown out along Sargent, and Ellice, until Strathcona. Along Notre Dame to Keewatin, then up Keewatin to Logan, connecting Weston to downtown via a lengthy storefront strip. Walk down Osborne to Jubilee, up Main to Leila, Portage to Assiniboine Park — a continuously walkable strip the entire way. A large, walkable city environment is something that our Winnipeg competitors Edmonton and Calgary cannot offer to the degree we can. This is our advantage and we have hitherto been ignoring it. Traditional shopping streets must be fully restored, to complete continuity. It is apparent why. But how we do it is bound to be difficult and at times unpleasant. Building standards must be introduced. On urban commercial streets, buildings should be required to be of a certain height and to have a faade that meshes with the street’s architectural history. Windows should be vertical, and most buildings should feature several residential storeys above one, two or more storeys of commercial use. This would expand the Exchange District and send its appealing flavour outward into the city. Along the aforementioned thoroughfares, there are already many old multi-storey buildings, often brick, of this type: Storefronts at bottom, sometimes second-floor offices, and several storeys of apartments above. We should take their traditional features as a stylistic model for infill. A renowned architect such as the neo-traditionalist, new urbanist Marianne Cusato, who is helping to rebuild a post-Katrina Gulf Coast, should be consulted as we reconstruct ourselves as the Chicago of the North. Someone like Cusato, who offered an impressive design alternative for the new Alaskan state capitol, could be commissioned to design a number of different infill buildings whose pre-approved plans developers could have the option of building. Most unpleasantly, creating continuity will require recovering lands currently occupied by parking lots, strip malls, automobile service stations, and prairie weeds. Expropriation might be necessary. One-way streets may have to be converted to two-way. Parking along commercial streets must be allowed on both sides, 24 hours a day. Although an adjacent LRT or subway stop offers tremendous benefit to any urban district, frequent and 24-hour bus service along mixed-use commercial strips will put feet on the street. Restoring the traditional shopping streets would benefit not just those who live on or near them, but everyone who lives near or visits Winnipeg. They make for interesting places to visit, and value spreading from the inside out helps the periphery. Isn’t it preferable to live in a suburb of a safe, bustling, tourist-friendly city as opposed to one littered with abandonment? Ying on We ditched our reliable 2011 Hyundai Elantra for a quirky 2009 Saab 9³ wagon. Here’s what happened. Gerald Katz on We ditched our reliable 2011 Hyundai Elantra for a quirky 2009 Saab 9³ wagon. Here’s what happened. Caroline on We ditched our reliable 2011 Hyundai Elantra for a quirky 2009 Saab 9³ wagon. Here’s what happened. Jansen Chris on We ditched our reliable 2011 Hyundai Elantra for a quirky 2009 Saab 9³ wagon. Here’s what happened. Kevin Palmberg on We ditched our reliable 2011 Hyundai Elantra for a quirky 2009 Saab 9³ wagon. Here’s what happened.